On October 2nd, our 21 new YONA students graduated from paper to wood, trading in their cardboard violas, cellos, and basses for real ones! Our new students sang their paper instrument songs, demonstrating their knowledge of the parts of their instruments and of how to hold their bows. Our returning violinists played an important role in the ceremony, accompanying the new students while they sang, and performing an excerpt from Handel's Water Music as a special tribute to their new friends. 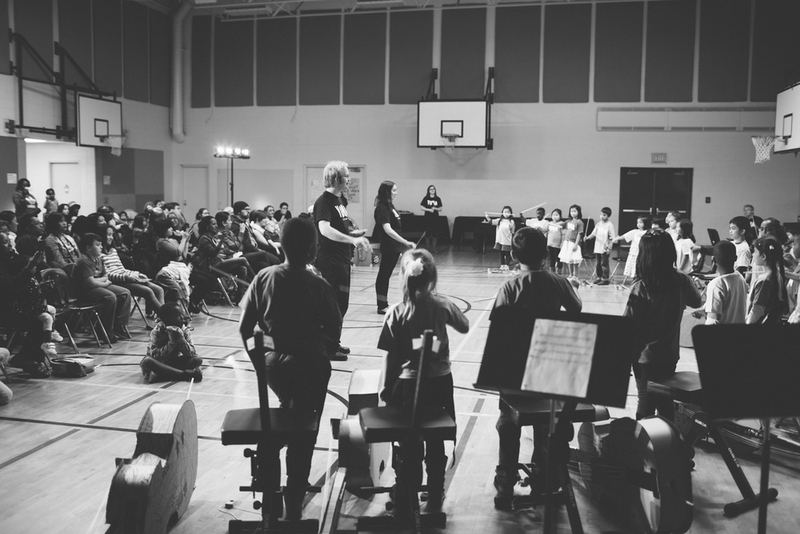 After their performance, each new student signed an instrument care agreement, crossed the stage to receive a certificate and shake their teachers' hands, and received their first real wooden instrument. I had the honour of presenting a number of the students with their violas, cellos, and basses, and I was overwhelmed by the joy and excitement on their faces upon seeing their instruments for the first time. They were even more excited to get to try them out, and they played their very first note together as a group in a magical musical moment. The program has been on a two-week fall break since that day, and we can't wait to get back to all of our students on Monday and make music together!